The dummy-proof, interactive feel of tablets makes them a natural for kids. But letting your brat actually get his grubby, possibly poop-covered mitts on your delicate iPad? It's probably for the best that we now have a tablet designed specifically for kids. The LeapPad Explorer tablet has a 5-inch capacitive touch screen, a built-in rear-facing camera, 2GB of storage and an accelerometer. It's just like a real tablet! Actually, despite its relatively large plastic frame, it feels surprisingly light in the hand—and sturdy. It's a job requirement for a kid-friendly tablet anything, yes, but it was still impressive to see a touchscreen device that felt like it would be no big deal if it was dropped in the parking lot. The apps I got to see focused mainly on the creative and interactive side of LeapFrog's learning-based mission. It has the obligatory Photo Booth clone with touch controls and a storybook app that lets kids stick their photos into ready-made pages and put them in any ridiculous order they see fit. But the really clever stuff is the profile-based dynamic content system. It completely retools stories for different reading levels, and offers more challenging tasks across all of its apps once a user "levels up" in an area. It just seems like something that will get a lot of replay value. LeapPad will come with four apps when it's released August 15th. There will about 80 more available at launch through an iTunesy marketplace, accessible through a Mac and PC client. 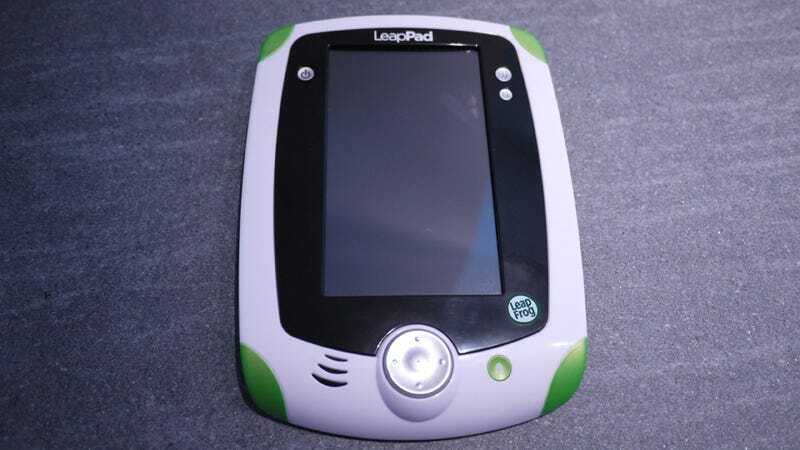 The company plans to offer about 100 total, but the LeapPad also takes cartridges from the older Leapster Explorer (backwards compatibility!). LeapFrog also crammed some social media features into its platform, but those are mostly for parents. The desktop client allows parents to save and share (through email and Facebook) more or less anything their kid does on the tablet, so you have clusters of that clogging your feeds to look forward to.